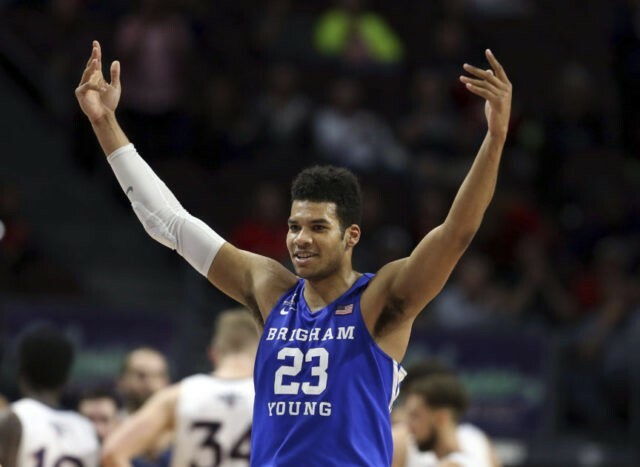 LAS VEGAS (AP) — Yoeli Childs scored a career-high 33 points to lead BYU over No. 20 Saint Mary’s 85-72 in Monday night’s West Coast Conference Tournament semifinals. Childs was 13 of 18 from the field, including hitting all three 3-point attempts. He also had six rebounds. Second-seed BYU (24-9), which shot 61 percent from the field, will play No. 7 and top-seed Gonzaga in the championship game Tuesday night. Elijah Bryant added 25 points for the Cougars, going 8 of 13 from the field and making all eight free-throw attempts. Jordan Ford led Saint Mary’s (28-5) with 27 points and six rebounds. The Gaels’ Jock Landale, who fouled out with 21 seconds left, had 23 points but only four rebounds. Landale committed his third foul with 1:49 left before halftime and fourth with 8:39 left in the game. TJ Haws had 11 points, while Dalton Nixon had 10 points and six rebounds for the Cougars, who will be making their first tournament final appearance in three years. Gonzaga beat BYU twice in the regular season and has won five straight WCC Tournament titles. After the Cougars led 41-37 at intermission, they expanded their lead to 67-54 with 7:35 left. Saint Mary’s cut it to 71-65 with 3:24 left, but the Cougars’ hot shooting helped them pulled away in the final three minutes. Calvin Hermanson had 12 points for Saint Mary’s, which now awaits an at-large NCAA Tournament berth. Both teams shot well from the field in the half, BYU at 61 percent, and Saint Mary’s 52 percent. The Gaels finished at 50 percent. BYU: The Cougars play in final against Gonzaga Tuesday night. Saint Mary’s: The Gaels are expected to receive a NCAA Tournament bid.